Bluestockings Bookstore canceled the screening of a couple of controversial HIV/AIDS films. LOWER EAST SIDE — Bluestockings Bookstore over the weekend abruptly canceled screenings of two controversial films contesting the commonly accepted science behind HIV/AIDS diagnosis and treatment, citing outrage from community members that had event coordinators fearful for the staff's safety. The activist bookstore had calendered "Positively False: Birth of a Heresy," which challenges the idea that HIV causes AIDS, and "Positive Hell," which suggests those diagnosed with HIV should refuse antiviral treatment, in back-to-back screenings as part of Saturday evening's "Rethinking AIDS" event. The even had purported to air "stifled" voices which "have the right to be heard," according to a description of the event on the bookstore's website, which has since been deleted. But on Friday evening, a representative of filmmaker Joan Shenton received an email from a Bluestockings team member claiming the shop had "misunderstood" the "angle and intention" of the films and would scrap the screenings. "These ideas are not ones that Bluestockings as an entity can support and for that reason, we are cancelling the event," reads the unsigned email shared with DNAinfo New York, sent from the shop's events email address to Desiree Marzan, who had facilitated the screenings on Shenton's behalf. But a subsequent email from the same email address clarified that the films were pulled primarily due to the massive outcry from community members, who had taken to social media to protest the event on Friday evening. In the email, the Bluestockings rep said the store had "never had such a mass movement of anger about an event." The store was obligated to cancel due to the outrage, said the rep, who also cited concern for the safety of bookstore employees. 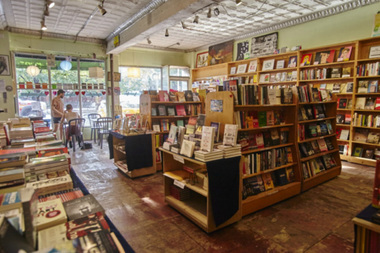 "Bluestockings is often the only place many of our community members have to go, and to jeopardize that physical and/or emotional safety of that space for them for an event is antithetical to our mission and violates our safer spaces policy, which as a collective member I am obligated to uphold," reads the email. Outraged community members had taken to social media on Friday evening to express anger and confusion over the screenings of the films. "WHY ARE YOU HOSTING AN AIDS DENIALIST EVENT TOMORROW? Have you seriously lost your f---ing minds?" wrote one incensed community member in a Facebook post time-stamped 9:59 p.m.
Shenton said she was "speechless and devastated" by the last-minute cancelation and accused the store of "outright censorship." She also claimed Bluestockings had abundant time to vet the films' controversial content instead of pulling them at the last minute. "[Bluestockings] had plenty of time to view the films and to get in touch with me, but this did not happen," wrote Shenton in an email to DNAinfo. "Instead, they sent an email in October 21st to Desiree Marzan, who first suggested the screenings to Bluestockings and was organising things from that end." She also pointed out that both films are available to watch online. A Bluestockings employee who answered the phone stated he was under the impression team members had been unaware of the films' content and canceled the screenings when they were informed by community members, but referred DNAinfo to the shop's events coordinator for more information. The coordinator did not immediately respond to requests for comment.